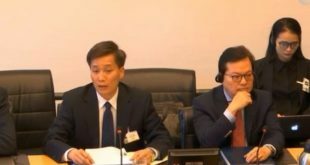 PARIS, 25 November 2013 (VCHR) – Vietnam’s first act after obtaining a seat on the United Nations Human Rights Council this month may be to adopt a new Constitution which undermines internationally-recognized human rights. The National Assembly is currently considering revisions to its 1992 Constitution (amended in December 2001) and is expected to adopt the amended constitution during the current session which ends on November 30, 2013. “The Vietnamese people hoped that revising the Constitution might lead to lasting political reforms” said Vo Van Ai, President of the Vietnam Committee for Human Rights. “But it seems that Vietnam is turning back the clock. If the National Assembly adopts the proposed amendments as such, the new Constitution will not only strengthen the Communist Party’s repressive control, but also reinforce arbitrary and inadmissible restrictions on the people’s fundamental human rights”. Whereas the former Constitution contained a simple clause formally stating that human rights “are respected” (Article 50), the new draft stipulates that “human rights and citizen rights” may be “restricted when necessary for reasons of national defense, national security, social order and safety, or the morals and health of the community” (draft article 15). 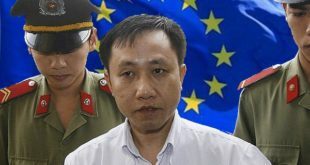 Given the vaguely defined “national security” provisions in Vietnam’s Criminal Code which have been routinely invoked to imprison hundreds of pro-democracy activists, bloggers and human rights defenders in an on-going crackdown on freedom of expression since 2010, this amendment is extremely disturbing. But there is worse. Draft Article 16, a new addition, states that: “Everyone has the duty to respect the rights of others; it is prohibited to abuse human rights and citizen rights to encroach upon the interests of the state, the people, and the legitimate rights and interests of others”. If adopted as such, this article in itself will virtually nullify all the other constitutional human rights guarantees. In Vietnam’s one-Party state, where the Police and judiciary are under Communist Party control, it will be the Party which draws the line between legitimate “use” and “abuse” of the peoples’ human rights. In the current Constitution, only Article 70 on the right to freedom of religion or belief has this caveat (“no-one may misuse belief and religions to contravene the laws and state policies”), and it has seriously impacted religious followers in Vietnam. Since Article 70 enshrines the right to “follow any religion or follow none”, those who follow a religion are automatically deemed guilty of encroaching on the rights of those who follow none. They face prosecution of up to 15 years in prison under Article 87 of the Criminal Code on “undermining the unity policy” and “sowing divisions between religious and non-religious people”. 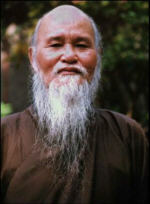 Members of the Unified Buddhist Church of Vietnam (UBCV), the Hoa Hao Buddhist sect, and especially ethnic Christian Montagnards have received heavy prison sentences under this “Catch 22” provision, which may now be extended to all other constitutional rights. In fact, draft article 16 repeats almost verbatim the terms of Article 258 of Vietnam’s Criminal Code, which has been widely denounced by bloggers and pro-democracy activists in Vietnam. 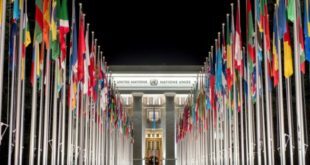 Before Vietnam was elected to the UN Human Rights Council this month, a movement of bloggers denounced the use of Article 258 to detain bloggers Truong Duy Nhat, Pham Viet Dao, Dinh Nhat Uy and other peaceful activists. They called on Vietnam to abrogate Article 258 to demonstrate its commitment to human rights as a candidate to the UN Human Rights Council. Instead of heeding their legitimate request, Vietnam is now considering enshrining this anti-human rights provision in the highest of all its laws, the national Constitution. One serious proposed amendment is the exclusion of the guarantee that no-one may be sujected to arbitrary arrest or detention. Whereas this clause exists in the 1992 Constitution (Article 71: “No-one can be arrested in the absence of a ruling by the People’s Court or a ruling or sanction by the People’s Office of Supervision and Control, except in case of flagrant offences. Taking a person into, or holding him in custody must be done with full observance of the law”. ), it has been simply removed in the proposed draft (article 22). 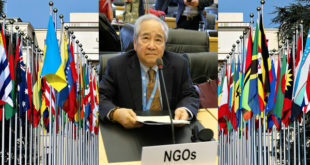 Since this is one of the fundamental rights enshrined in the UN Universal Declaration on Human Rights and the International Covenant on Civil and Political Rights (ICCPR) to which Vietnam acceded in 1982, it is extremely disturbing that Vietnam now seeks to abolish this guarantee and thus strip individuals of constitutional protection against arbitrary arrest. Most disappointing for Vietnamese people is that Article 4, which enshrines the political monopoly of the Vietnamese Communist Party, remains firmly embedded in the draft. During the public debate on constitutional reform launched by the authorities in January 2013, this was the most hotly-debated issue. For the very first time, online petitions such as the “Proposal for Reforming the Constitution” and the “Declaration of Free Citizens” drew thousands of signatures from prominent Communist Party veterans, intellectuals, students and bloggers alike, calling on the Party to abrogate Article 4 and embrace pluralism and mullti-party democracy. In the new draft, Article 4 is not only maintained but also expanded, defining the Communist Party not only as the “vanguard of the Vietnamese working class” but of “the Vietnamese people” as a whole. A tightening of the Communist Party’s control is also found in the new draft regarding the army and police. Whereas the 1992 Constitution stated that “people’s armed forces must show absolute loyalty to the motherland and the people” (Article 45), the new draft demands that they also “show absolute loyalty to the Communist Party of Vietnam” (Article 70).This appears to reflect the Party’s anxiety about its fragility in the global context of political change, and its need to ensure the army’s protection of the regime. Indeed, one of the key demands of citizens’ petitions throughout the year was precisely the “depoliticization” of the armed forces in Vietnam.